On August 5, 2008 JESS3 and I introduced version 1.0 of The Conversation Prism. Today, I’m proud to announce The Conversation Prism Version 3.0. With the introduction of 3.0, our view of the social media panorama is updated and also reflective of the real world that is embracing and organizing the social Web. One of the aspects that make social media so fascinating is the conversations that define the culture and value of each community. While many of us operate on the information that fill public streams, sometimes the most interesting aspects of a story take place in the back channel. The Conversation Prism has its own story and I’d like to share it with you. As an aspiring social scientist, I was inspired to map the social media universe by both features and capabilities and also how people were really using these tools, networks and services. Doing so, would help us better understand how to survey the landscape by approachable groups rather than as a single entity, which to many, was and still is, an intimidating task. At the time, there were many posts and discussions that created a perception that people and brands needed to expand their reach and presence by engaging everywhere. It occurred to me that each network featured a search box and as budding brand managers, both personal and professional, we could use keywords to reveal conversations and determine whether or not our presence was required. In the networks where activity was flourishing, I was able to listen, document, and learn how to engage in each community with a mission, purpose, and value-added perspective. Keep in mind that at the time, listening and monitoring solutions were fledgling. 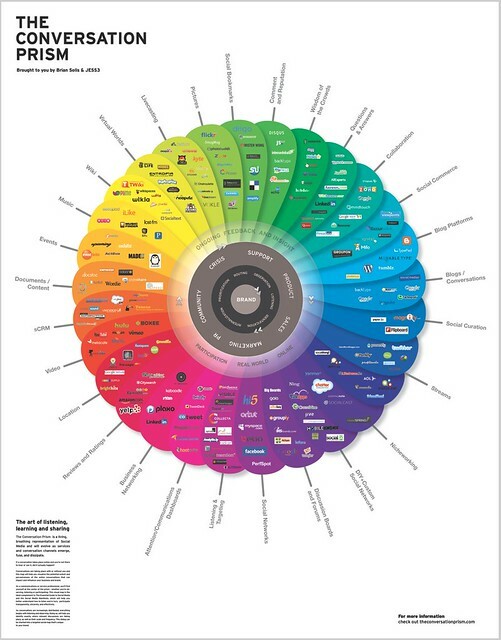 With Version 2.0, introduced in March 2009, The Conversation Prism visualized Social CRM (sCRM) to help businesses recognize the opportunity to listen, learn and adapt. The hub was now a rotating visualization of conversational workflow to inspire the socialization of business and to introduce conversational touchpoints across the organization. Without further ado, allow me to introduce you to The Conversation Prism V 3.0. Like its version 2.0 predecessor, 3.0 represents considerable evolution. Of course certain networks and tools have vanished or merged and at the same time, important new services have emerged. You’ll notice that the categories have also transformed quite a bit. Some branches have collapsed, consolidated and new classifications were established. Version 3.0 is hosted at TheConversationPrism.com. We’re adding a variety of sizes and formats for you to download and use freely (with credit to Brian Solis & JESS3 of course). And for those who enjoy wall art, v 3.0 is also available as a 22 x 28 vertical poster. 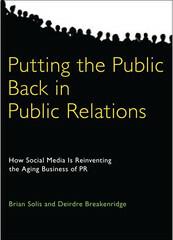 This is one of the most definitive resources for Social Media, all the way since its first incarnation. 3.0, at the same era as WordPress 3.0 ;). What will 4.0 give us? Holarchies here in place, where social software/media/web are the meta-parts to count in when we only take three generic terms capturing the infrastructure of this. Time to wrap up some mega-insights to contextualize this and other strands of thought, in relation to actually trans-shift the world. For the better. Thanks for being there in creative commons shared support for us who try to communicate how to Engage! people in the fun of Engaging! 🙂 ;). Brian, thanks for including http://www.edocr.com on version 3. I attended your Optsum keynote in Dallas a few weeks back, and since then I had a very interesting social media interaction with Best Buy, via a blog post review that I wrote. I figured you might be interested to see how a major corporation like Best Buy is doing social media when they don’t think that anyone is watching. Check out the link below. Happy reading!